Vidarbha winning the Ranji Trophy for the second consecutive time is a success story worth celebrating. For the fact that it was not only about how many players put up their effort day in and day out but it was also about a victory of the process that has been in motion for quite some years now. For all the glitz and glamour of the dreamlike matrix called the Indian Premier League, the Ranji Trophy has certainly held its charm. The IPL might have accentuated the progression of the players and made sure that the pipeline is always brimming with talent, but the Ranji Trophy has never lost its importance. For every Virat Kohli, there is a Cheteshwar Pujara who works hard, turns up for his state team in every possible opportunity and proves that the struggle to achieve the success at the highest level is real. It is only good for the domestic cricket that in the last few years, the presence of those few players have helped their respective teams get a cutting edge. Vinay Kumar invariably turns up for Karnataka all the time, Parthiv Patel has a colossal presence in the Gujarat dressing room, Pujara turns up whenever he has even a week off from the international calendar and the likes of Umesh Yadav and Mohammed Shami leave no stone unturned to feature in their side’s campaign. Their presence has also changed the mindset of the young domestic players and they started believing that the small teams can also win the championship by themselves. It resulted in the traditional dominance of Mumbai, Karnataka, and Delhi being reduced drastically to a point that Vidarbha’s success story is no more considered as an underdog tale rather a perfect blueprint for others to follow. For the followers of domestic cricket, the success of the Vidarbha batch of 2017-18 and 2018-19 was hardly surprising as the base had been laid out over a decade ago when Shashank Manohar was elected as the BCCI president, and since that day, Vidarbha ensured that they were on the right path. Manohar, a lawyer by profession and the president of Vidarbha Cricket Association, started working towards the establishment of a residential academy in Nagpur and found a perfect ally in the form of Prashant Vaidya, the only player from Vidarbha to have represented the country until then, having played four ODIs in 1995 and 1996. Vaidya was a decent domestic cricketer, averaging over 28 in his 56-match-long first-class career, but he had a clear vision in mind and once he got a free-hand from Manohar, he started working towards making Vidarbha a competent domestic unit. The first thing that was on his list was to hire Neil D'Costa, who made Mitchell Starc the tearaway quick that he is from a wicket-keeper before working with Michael Clarke from a very tender age. Vaidya made D’Costa the chief coach of the academy while appointing Sulakshan Kulkarni as the head coach of the senior team and former India pacer Subroto Banerjee as the bowling coach of the academy. It turned out to be an inspiring decision. The grassroots work started with the full flow and with VCA providing full support to Vaidya’s work, the local inter-district competitions started in the multi-day format from 2009 with junior cricket getting equal importance as much as the senior cricket did. The likes of Umesh Yadav and Salabh Srivastava got full support from the association for all the endeavors. On the other hand, working with D’Costa also helped Yadav understand the responsibilities that come up with being an international cricketer, the psychological remuneration of being fit, which helped the latter increase the pace and the level of fitness. When the Aussie, along with Kulkarni, left the academy in 2011, VCA then hired Paras Mhambrey, the former India pacer, to coach the state team. Mhambrey understood that hiring professionals was the best foot forward in a bid to give young players of the state a chance to take a leaf out of the seasoned cricketers’ work ethics. Shiv Sundar Das left Odisha to play for Vidarbha and once the trend was set, Subramaniam Badrinath, Sairaj Bahutule, Rashmi Ranjan Parida, and Hemang Badani came in and it is certainly not a co-incident that Mumbai’s Wasim Jaffer scored 595 runs and 1037 runs respectively at an average of over 50 in the last two years. While Mhambrey and Vaidya had, of course, a big role to play in the team making themselves capable enough for the consecutive title run, the role of Chandrakant Pandit can never be overstated. In 2016, Pandit, then Mumbai coach, had developed a sore relationship with few of the officials of Mumbai Cricket Association, and upon Vaidya's insistence, he decided to move to Vidarbha. The former Indian wicket-keeper is known for his regimental work ethic and putting winning ahead of everything, and that rubbed onto the team when the unassuming players like Aditya Sarwate, Akshay Wadkar, and Rajneesh Gurbani started shining, with an able Faiz Fazal leading the way. Pandit’s inclusion also brought another thing to the table that most domestic teams are not acquainted with. Here is a man who is not going to bow down to any association pressure and is ready to do everything required so as to bring the most of any players. Vidarbha players were raw and ready to go through the rigmarole under Pandit. It reaped dividends eventually. 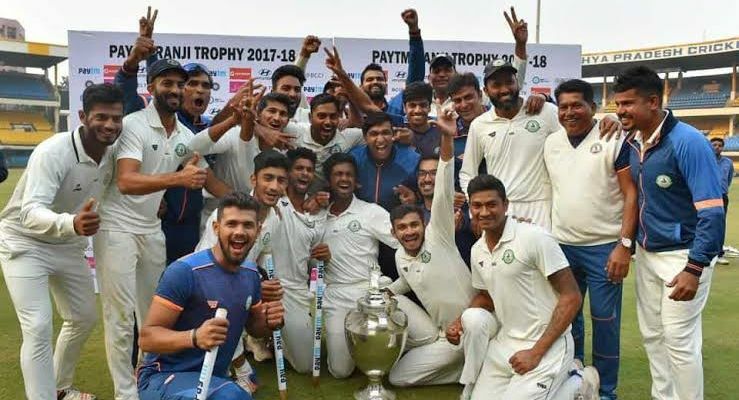 While players of most states play Ranji Trophy so as to get into the India A side, Vidarbha started playing for that Trophy, to prove that what they had achieved last year was not a fluke by any means. By doing that Vaidya, Pandit and his team made sure that the national selection would just be a matter of time if they can be consistent in their approach. They identified the players who can win them the trophy and meanwhile, they formulated their strategy around them, nevermind Umesh Yadav comeback for the knockouts made an instant impact in the team, bagging the man of the match award in the semi-finals against Kerala. That is the kind of structure which is the need of the hour for the other teams. Simply because Vidarbha’s title run is not about any one person in particular rather it is about the association bringing many forces together to form a structure, and then sticking to it for more than one decade to eventually script the success story. Other teams would silently take notice.